VIC Two witnesses observed a large vertical triangular shaped object with a bright orange light at each point. Object was first sighted when it was hovering. Then it began to move erratically. As it approached the couple, one ran into the bush before the object disappeared. VIC Object "larger than the moon" flying from SW to NE at a speed near 400 KMPH. The object described by the pilot witness as a huge ball of light with tail same colour. It went into a dive as if to land NE of Inverlock over Andersons Inlet. Doncaster. VIC. Elliptical shaped object about 80% of Moon's size - travelling South to South West.- in a straight path. It took 4 minutes to fly out of sight. VIC Witness observed three balls of white lights with red tails viewed for only a few seconds flying faster than a jet flying north to north-east. Observer lost sight of lights when they passed behind trees. VIC The witness, who desires to remain anonymous observed a light aircraft flying toward Essendon Airport for landing. Flying at the same speed, just ahead of the aircraft, was a ball shaped object three to four meters in diameter. The front of the object had the appearance of light silver coloured steel. The rear colour was steel grey. The witness was on his bike heading toward north east when he heard the sound of an aircraft overhead. When he looked up, he saw both the ball shaped object and the aircraft flying in the direction of the airport. Small lights or sparks appeared to be spinning off the object in a wheeling direction. Efforts are being made to secure the pilots name, who has, as yet, come forward. If the pilot will contact us and confirm this sighting he can be assured his name will be kept confidential. Oakleigh. VIC. An object, cream color with lights which looked like a saucer upside down - flew from South East to North West. Werribee. VIC. Two bright round lights travelling very slowly upwards on a slight angle. - had long tails. Then tails got shorter until they disappeared and another round, bright star-like object appeared following the first one, only smaller. It stayed for about two seconds then it disappeared. The original one then dimmed slowly like it was moving away at great speed, until it also disappeared. Northern Territory outback A bright light larger than the morning star was observed travelling at approximately 5,000 feet from the southern horizon to the northern horizon. As it passed overhead, the light appeared to shine downward. There was a bright tail attached, similar to a vapour trail which did not alter appearance. 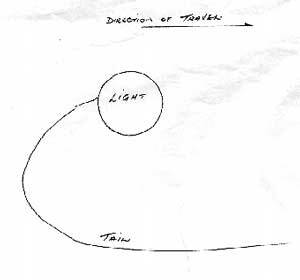 The interesting point is the tail was in front of the light travelling in the same direction as the light. The time span from its appearance was about 60 seconds and travelling in a zigzag motion. A large group of Australian aboriginal people observed the light while it was hovering for a time then left at high speed to the north. Eldorado/Carrargarmungee Report from North East Area Representative, James Owen. (on Riddells Creek Road) VIC. An object about twice the size of a 4-wheel drive, passed about 20 metres from driver. It was a grey object with blue beams on top and orange beams on bottom half. The speed was estimated at about 100 kms. It was in sight for only 10 seconds. Kilsyth. VIC. An oval flat shaped object was observed by two witnesses. The color of the lights was bright orange. The object made a low humming sound and there was a smell of hot iron. It was larger than a 747 aircraft. It made a sharp turn then shot away. Photographs were taken but did not turn out. Developer of negative said it was unusual, due to the fact that there were pictures taken before the incident and then 6 blank frames, then pictures after those photos. It was unusual because there was no over exposure or seepage of light on those negatives. Robertsons Beach VIC. Two witnesses reported seeing two objects. The first one was a bright white light, the second one appeared. - it was an orange color. They were flying from S.E. to S.W. The second object was about half the size of the first one, about the size of a 5c piece held at arms length. They vanished suddenly. 02.23 hrs. Observer was taking her dog outside when she saw an object larger than the moon, followed by smaller lights. They were below the clouds, first travelling slowly, then disappearing suddenly. Investigations are continuing. (near Lake Eildon) Report from North East Area Representative, Mary-Louise Owen. Echuca, VIC Report from North East Area Representative, James Owen. Albion, suburb of Melbourne A round light about three times the magnitude of Venus travelling about the movement of the space station Mir, only it was first seen in the east at around 15 degrees elevation. At zenith, its elevation was about 85 degrees. Last seen in the northwest sky at about 30 degrees elevation. The colour was orange-yellow. When viewed through Pentax binoculars, "flames" could be seen that were not visible with the naked eye. Two witnesses saw the object through binoculars. Object was viewed for five minutes before it disappeared. Wandin, VIC Two witnesses, a mother and teenage daughter, reported a red-orange football shaped object with small bright lights across the top. The object was larger than the apparent size of the moon, with two large lights, one on each end of the object. It was moving slowly toward the west. At its closest point to the witnesses, about 150 metres, it turned to a position facing the witnesses. It then disappeared behind gum trees. Sandringham, VIC A motorist was driving along Beach Road towards Hampton when he saw a bright white light. It moved until it hovered over a bridge. The motorist then became scared when he heard a buzzing sound and left the area "in a hurry". 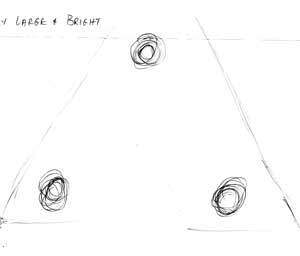 Near Ballarat BZ reported a saucer shaped object with a dome on top. The object was shining like metal. Viewing time was 12-15 seconds. Size was about the same as a large car. When it was first seen, it was hovering before speeding away. Westgate Bridge, Melbourne VIC Observer was crossing over Westgate bridge heading toward the Western Suburbs when a bright blue/silver light came from the Footscray area and shot through the sky lighting up the surrounding area as if day time. It lit up sky in 5-10 KM radius. Copyright&COPY; 1996 Victorian U.F.O. Research Society Inc.